As we have journaled, logged and blogged everyday for a year, it’s hard to accept an ending. When interesting things happen now that we are home, we feel the urge to run write it down or to snap a photo. But they say all good things must come to an end. We end our blog with several thoughts or quotes that we never found the right place to fit into our journal of our trip. We add these for ourselves to remember mostly, but hope you enjoy as well. 20 states, 2 countries, 7,134 miles, 115 locks, hundreds of new friends. 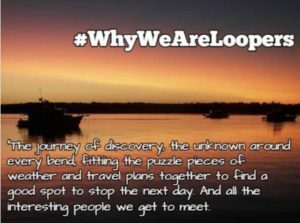 Not every day on the Loop is beautiful and not every day is easy, but without a doubt every day is interesting and adventurous and challenging. The not knowing what you will encounter each day is both a curse and a blessing. At the end of each day, when you secure your lines, you feel more alive than before. We collected over 300 boat cards from people we have met along the way. While it’s wonderful to be home with our family and friends, we can’t help but think of all the new friends we met on this special journey. Men in Canada don’t wear shirts – random! (Don’t ask). 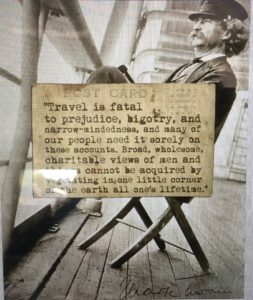 Mark Twain Quote…..“Travel is fatal to prejudice, bigotry, and narrow-mindedness, and many of our people need it sorely on these accounts. Broad, wholesome, charitable views of men and things cannot be acquired by vegetating in one little corner of the earth all one’s lifetime”. What was the best part about the trip? There were so many unique experiences we can’t pick just one. What was the worst part about the trip? Several of these as well. What was the scariest part of the trip? Although we never feared for our lives, there were a number of anxious moments. We don’t have enough time or space to answer these, please see our blog! 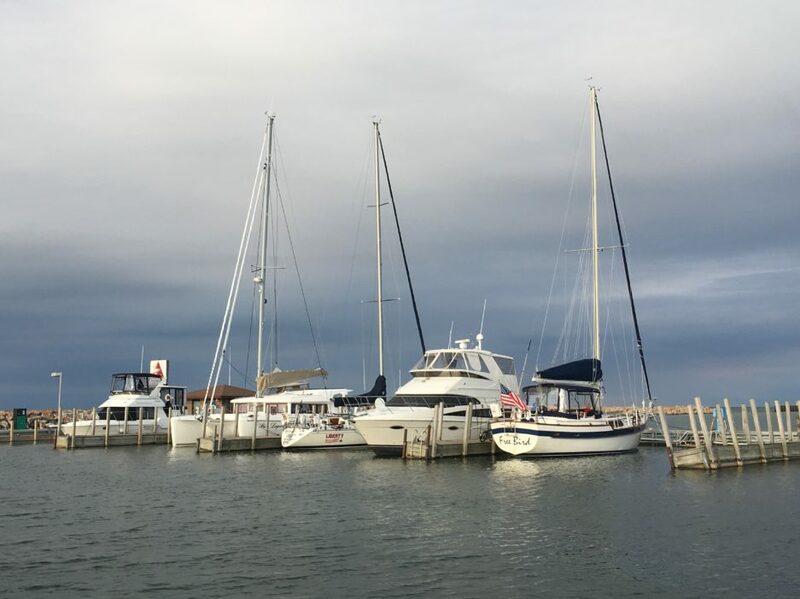 We now more than ever appreciate what the name of our boat means – it was our home……”Cara Mia” is Italian for “My Beloved”, the song is a ballad about “never wanting to leave her”……(Jay and the Americans). We changed the “C” to “K” – our Kara Mia also stands for our initials, “Karen And Ron Atkisson”! < Previous Changes in Latitudes, Changes in Attitudes…….